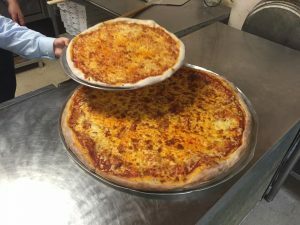 Baltimore’s Tov Pizza is now selling their delicious pizza and other dishes in the Downtown area. The One South Street lobby shop is stocked with all kinds of dairy goodies from the main pizza shop. The regular menu features all different kinds of pizzas. Customers can order regular, gluten free, 18 or 12 inch pies, with an array of toppings. Soups, salads, and knishes are on the menu as well. There are broccoli, spinach, onion, mushroom, eggplant parmesan, supreme, and extra cheese calzones. Grilled cheese, tuna, tuna melt, pizza melt, eggplant parmesan, and fried fish can be ordered as sandwiches, subs, or paninis. There are many other dishes to order from. From lasagna and mac & cheese to falafel and hummus, there is something for every member of the family. Tov Pizza is certifed by the Kof K.